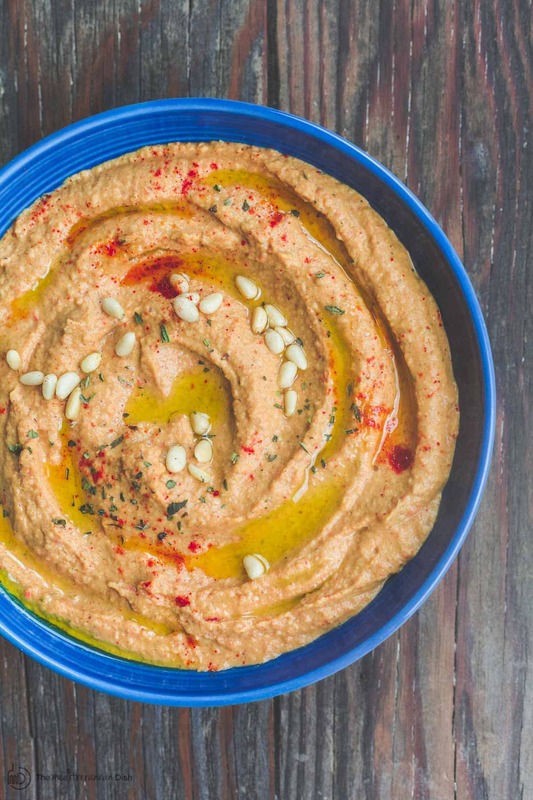 This roasted red pepper hummus recipe stays true to Mediterranean flavors. An un-fussy, rustic dip…packed with flavor, and a bit on the punchy side. Makes the perfect intro to any dinner party! Hummus makes the opening of nearly every dinner at my house; so it’s no secret how much I appreciate it. 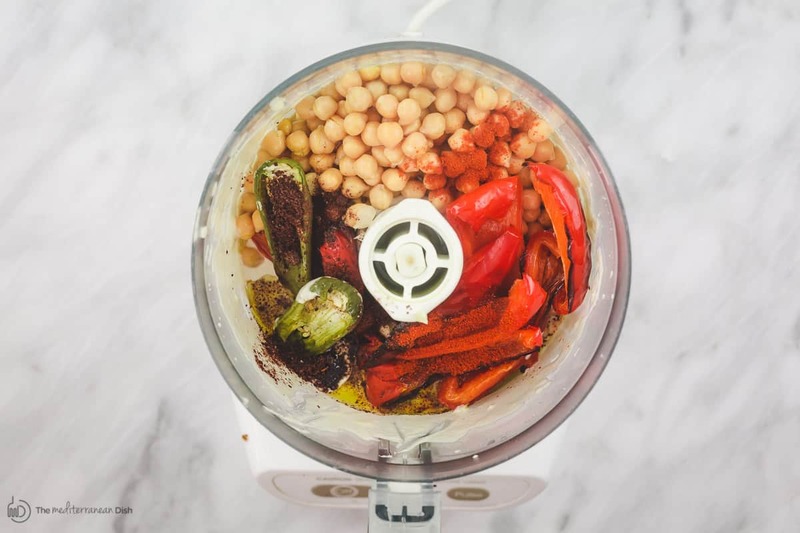 Of course, there is my lengthy ode-to-the-mighty-traditional-hummus, where I share tips and tricks to making the creamiest traditional hummus…from scratch! If you’re a “hummus purist,” you’ll definitely want to check this tutorial out. But this quick roasted red pepper hummus is an equally delightful dip that I’ve been making more frequently. I started with a bare-bones type recipe– red peppers; chickpeas; and tahini. But then I imagined a punchier version, so I added a roasted jalapeno pepper. 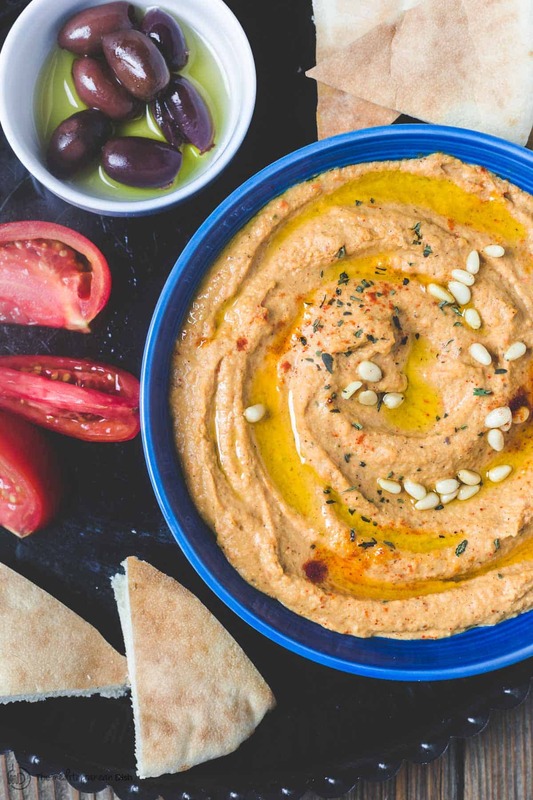 A pinch of sumac and sweet paprika, while not entirely necessary, do take this roasted red pepper hummus recipe to a new level of delicious. Maybe it’s just me, but I think they do make the dip just that much more earthy and satisfying. 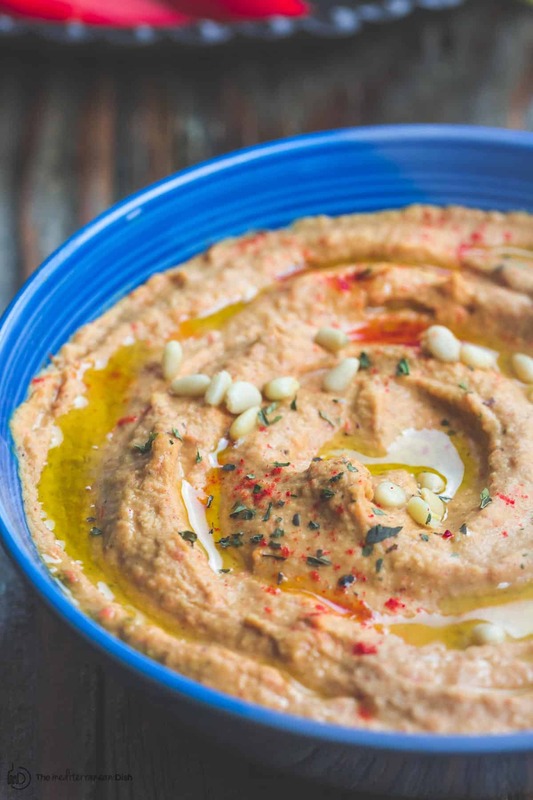 In a pinch, I use canned chickpeas for this roasted red pepper hummus recipe. And you’ll notice, I don’t do the work of removing the skins here. In fact, the skins remain on both the chickpeas and the roasted peppers. The result is not meant to be the most ethereally smooth hummus, but rather a rustic, “kicky” dip. All that’s needed is warm pita bread to swoop through. I have occasionally packed this hummus and a heaping portion of this Mediterranean chickpea salad in one lovely pita pocket for dinner! Simple and delicious roasted red pepper hummus recipe. This recipe stays true to Mediterranean flavors. But adds jalapeno pepper for an extra kick. A must-try! 2 tbsp toasted pine nuts, optional. Place the red bell pepper strips and jalapeno in a small baking dish or cast iron pan. Drizzle generously with olive oil. Bake in the 425 degrees F heated oven for 25 minutes or until tender. In the large bowl of a food processor, add the roasted peppers and all the remaining ingredients except the toasted pine nuts. Add 2 tbsp extra virgin olive oil. Run the processor until you reach the desired creamy paste consistency. Test and add more salt if needed. Run the processor again to combine. Transfer to a serving bowl. Top with a little more extra virgin olive oil and the toasted pine nuts. Add a pinch of paprika or sumac for garnish, if you like. Serve with warm pita bread and sliced veggies for dipping! Enjoy! Begin by roasting the sliced red pepper and jalapeno. 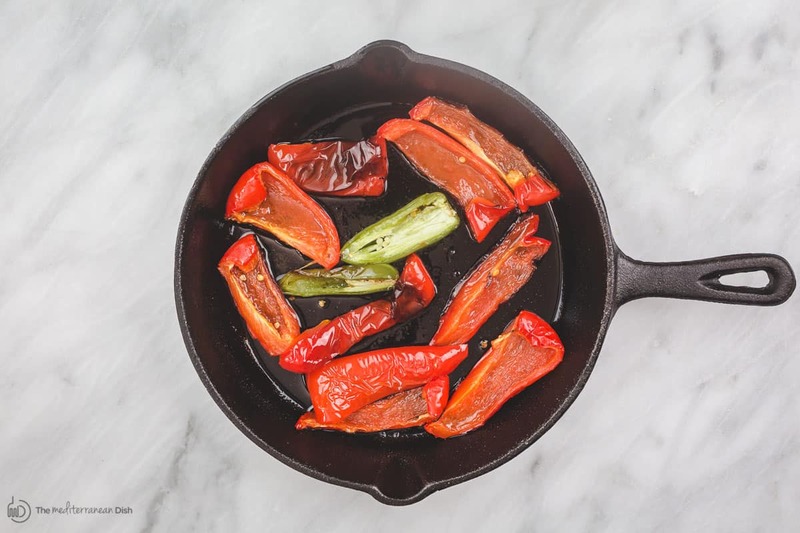 Add the peppers and a generous drizzle of olive oil to cast iron skillet or oven-safe pan. Bake in a 425 degrees F heated oven for 25 minutes or so until softened. If the skin is slightly charred, that’s a good thing! Set the pepper aside to cool completely. Once completely cooled, put the roasted peppers and cooked or canned chickpeas and all the remaining ingredients (except the pine nuts) in the large bowl of a food processor. Run the processor to blend until you reach the desired creamy consistency. But remember, we left all the skins on the chickpeas and the peppers, so this is more of a rustic hummus than it is an extra smooth one. Taste the hummus and see if you need to add any salt. Then transfer to a serving dish and top with olive oil and pine nuts…maybe a touch of paprika or sumac for good looks! Enjoy with pita bread and veggies. Disclaimer: This post may contain affiliate links. As an Amazon affiliate, I receive a small credit when you make an Amazon purchase within 24 hours of clicking a link provided here. If you are looking for a specific product, feel free to browse Amazon via this link. Thank you! 3rd time making this. For my cheese and meat board on Christmas morning. Hi, I don’t have a food processor. 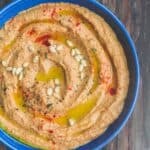 Can I use a blender to make this hummus? Thanks! Hi Nicole! If you have a good blender, it should work out. WOW!!! Soooooo good! I love Hummus! I added a heaping Tbsp of garlic! To keep the vampires away…LOL!!! 2 Thumbs up!!! Love the garlic lol! Thanks for sharing, Aimee! I am an unabashed hummus snob. I’m fortunate enough to live within driving distance of our city’s best and most authentic middle eastern grocery and they make absolutely the best hummus I’ve ever had. This recipe is AMAZING. I can’t recommend it highly enough. Follow all the instructions to a T (except it doesn’t need any salt). Good Tahini and the Sumac are essential as your hummus is only as good as your Tahini and the Sumac definitely adds a necessary, unexpected note. This recipe for hummus looks amazing. I make hummus a lot but will add these extra ingredients next time. Thanks so much. best hummus recipe ever! So delicious. Do you have a beet hummus recipe also? Thank you, Peneolope! I’ll work on a beet hummus for ya sometime…not sure when…but I’ve thought about adding one! It is! Hope you give it a try. Is there a sub for the tahini? It’s about $7 a jar, and I’m not sure I’d have any other use for it. Thanks. I just found your blog, and I love it! Beautiful photos and recipes. Love Mediterranean food. Hi Vicky! There really is not a substitute for tahini, but it does keep well for a while. If you plan to make hummus again, it is worth the investment. But I completely understand. The only other thing would be to eliminate the tahini and perhaps reduce the amount of remaining ingredients. But I can’t say that I have tried it that way. A substitute I have tried for Tahini (was found on another web site) is peanut butter. I used equal amounts peanut butter as was called for tahini in the recipe. It was not bad. It had enough oil for texture, and depending on the other herbs and spices added, really buried the peanut butter taste. Hey reader! If you have any doubts about this recipe, then doubt no more! Hands down the best hummus I ate, let alone speaking of me MAKING it! thank you Suzie! ? Saba, that is wonderful to hear! Thank you so much for the kind comment. It means a lot to me! Going to an Election party, taking this and your baked Brie with figs, walnut, and pistachios! I follow a lot of cooking blogs and The Mediterranean Dish is by far my favorite. Thank you Suzy for all the amazing recipes. Russ, that’s great to hear! The brie is a favorite of mine. Hope the party was fun. Thanks for your encouragement! I’ve recently tried an Egyptian dish called Ful E-Mdamis. It should fall into the Mediterranean Diet acceptable dishes. Do you have a recipe for this? Hi Joel! Yes, it perfectly falls into the Mediterranean diet. It’s the national dish in Egypt, and that’s where I grew up! So I do have a family recipe that I have yet to post on the blog. Hopefully early next year. Ugh! The little market near my house was out of the roasted red pepper hummus today!! I have been craving it!! Hope u love it! It’s a favorite at my house. Will definitely try this … I want to see my Mum’s face when she sees/tastes this!!! Hi there, Renee. Glad you found me, and I hope you stay in touch! 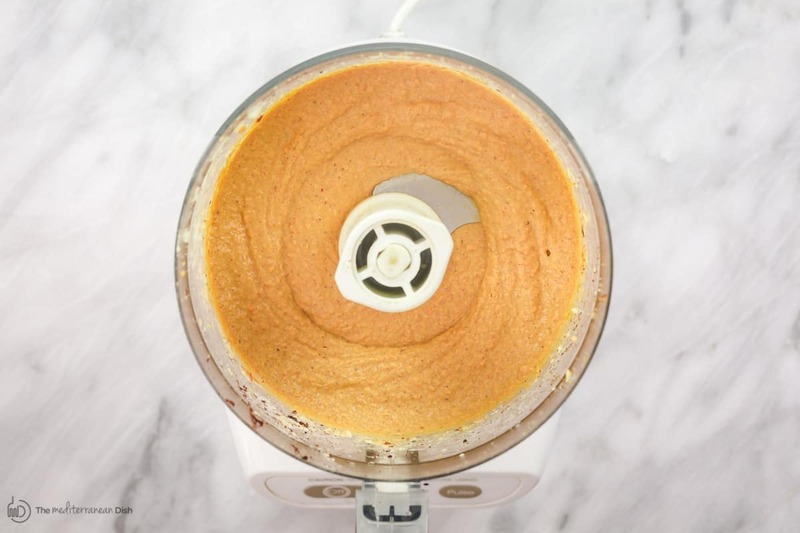 Let me know how the roasted red pepper hummus turns out for you. Wow–that looks delicious and making your own is such a great idea to use fresh ingredients that are hand picked. Definitely making this ! Wow this red pepper hummus looks delicious and full of yummy flavours. I have never made hummus before so I definitely need to try your recipe, thanks for sharing it! Hi Thalia! You will love this hummus, it’s a fave in my house. Thanks for keeping in touch! This looks wonderful! I can’t wait to give it a try. What is your favorite brand of tahini to use? Paula, thank you for your comment! I do love roasted red pepper hummus, and this is a favorite recipe. Can’t wait to hear how you like it! As far as a favorite tahini brand, I have been using Holy Land; it’s a brand out of Minneapolis and they have a large grocery store there that I occasionally visit. I have been happy with Holy Land products and will probably continue to use them. But I have also used other brands like Ziyad Tahini, which is fairly cheap and available at large grocery stores; I have even found it at Walmart in the past. Amazon has a few options; Baron’s Kosher 100% Pure Ground Sesame Tahini is highly-rated, and I do like this one a lot. Kevala Organic Sesame Tahini seems like another good options from Amazon, but I have not tried it. I honestly stay midway when it comes to tahini, no need to pay too much 🙂 If you have a local Middle Eastern grocery store near you, you might check there first.